Relief Pitcher is without a doubt, one of the best presented sports games on the SNES. It has all the bells and wistles you would expect out of modern baseball video games, which is an impressive feat on a 16 bit game. However, its lack of options leave this game as somewhat of a disappointment. As far as graphics and sounds are concerned, Relief Pitcher is excellent. The players and stadiums are well animated, though some of the player images that pop up before each bat look a bit goofy. 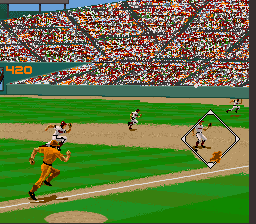 The game uses a behind-the-catcher view, and when there is a hit, it merely rotates the screen a bit, rather than moving the camera to where the ball is going. There are only four teams, but the stadium characteristics are similar to their real life counterparts (for instance, the Boston team has the green monster) There is full voice commentary, which is rather novel for a Super NES game. The game doesn't contain much in the way of music, aside from the menu screens. As far as gameplay goes, Relief Pitcher suffers. The pitching setup (with a strength gauge) is similar to many golf games, and works very well, and there is a box that shows the strike zone. However, batting seems to be an exercise of randomness. You have the option of weak swing, strong swing and bunt, but I did not seem to find any sort of strategy of when you can actually hit one out of the park. I found that there were far too many opposite field hits, which seem kind of odd. You have no control over fielding the ball, which is the worst thing. I thought that the outfielders wait far too long to go after a ball. Rather than manually controlling which way the player runs, you have to press a button to tell the player to run, and he always goes towards a base. On the whole, the main complaint about Relief Pitcher is that it has a distinct lack of options. Though this game goes for realism and presentation, quite frankly it is boring. I would suggest looking for other baseball games, even a primitive game like Super Bases Loaded has more variety.